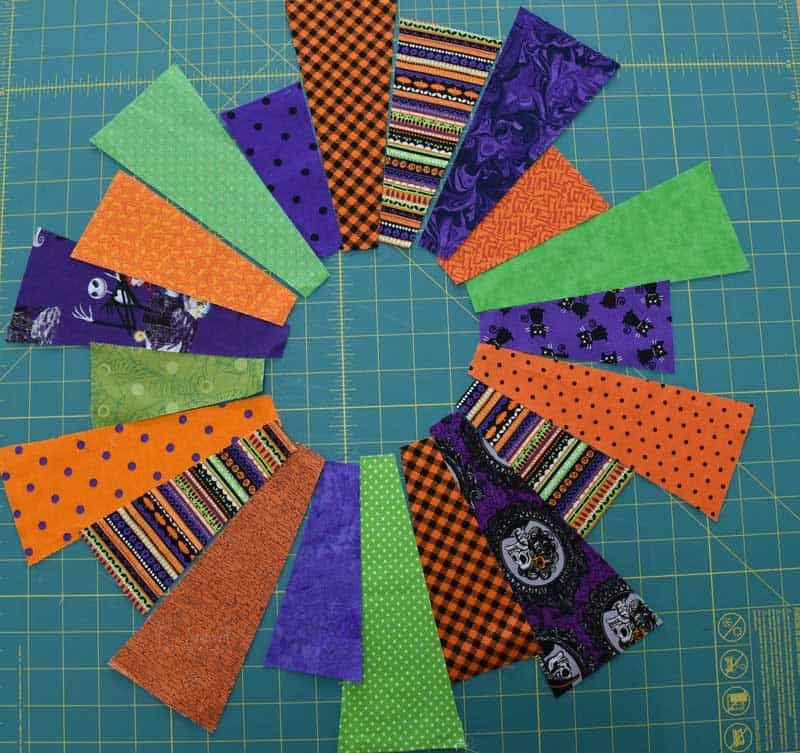 This week, I’m participating a Halloween Sewing and Craft Party with a group of bloggers (links at the end). 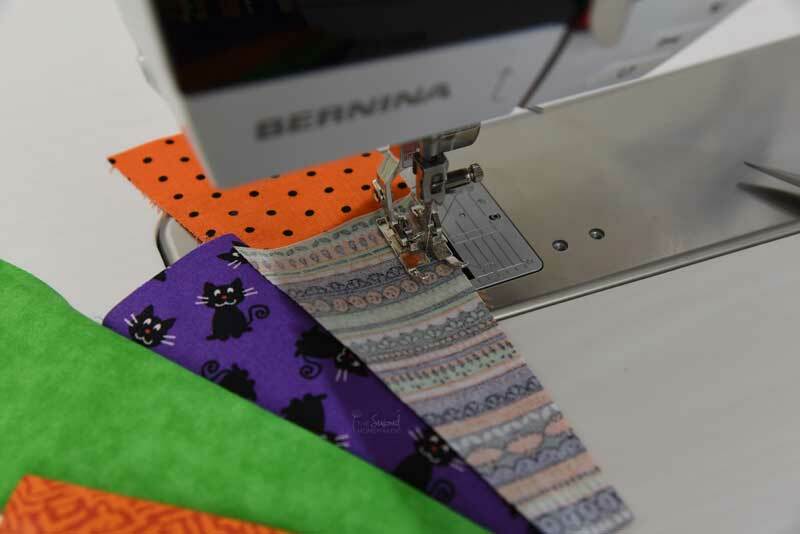 As a group, we hope that this series will inspire your Halloween sewing projects. 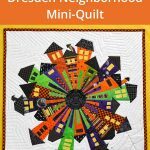 For my project, I chose to create this Halloween Dresden Neighborhood Mini-Quilt. I was supposed to attend a workshop for this pattern a few months back but missed it. 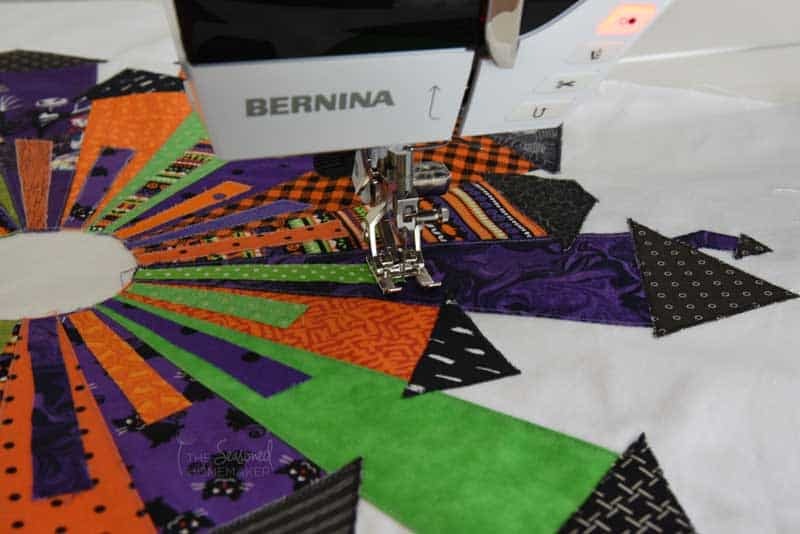 So, I thought that this Halloween series would be the perfect opportunity to get you in the mood for some Fall sewing. I recommend getting the pattern because it includes measurement details and the order to follow. For the most part the steps are simple to follow and most beginners should be able to tackle this project. Step 1 – Cut out your houses. The pattern gives you specific directions for this step. Step 2 – Stitch the houses together. 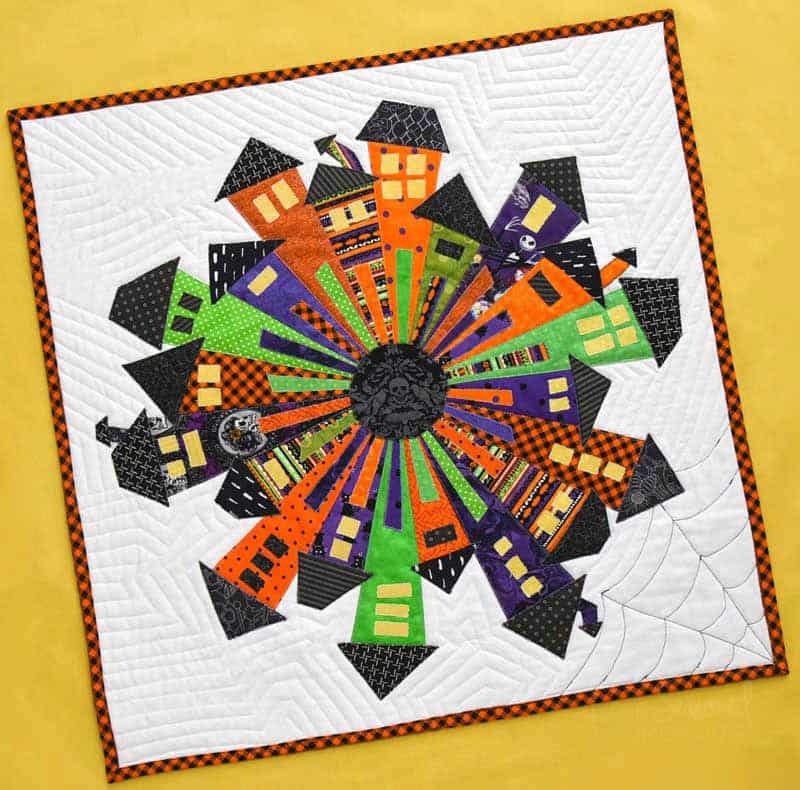 Step 3 – Place neighborhood onto background fabric. 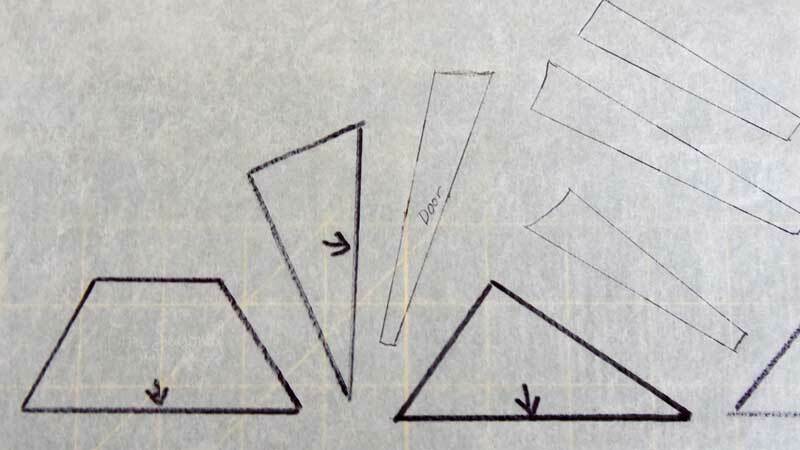 Step 4 – Draw your roof shapes, door shapes, and window shapes onto the paper side of your fusible product. I numbered all of mine to keep them in order of how I wanted them to look. This took a little more time, but I’m glad I took my time on this. It really can make a difference. Rough cut around your designs and follow the pattern directions for creating the appliqués. Fuse the designs to the individual houses. 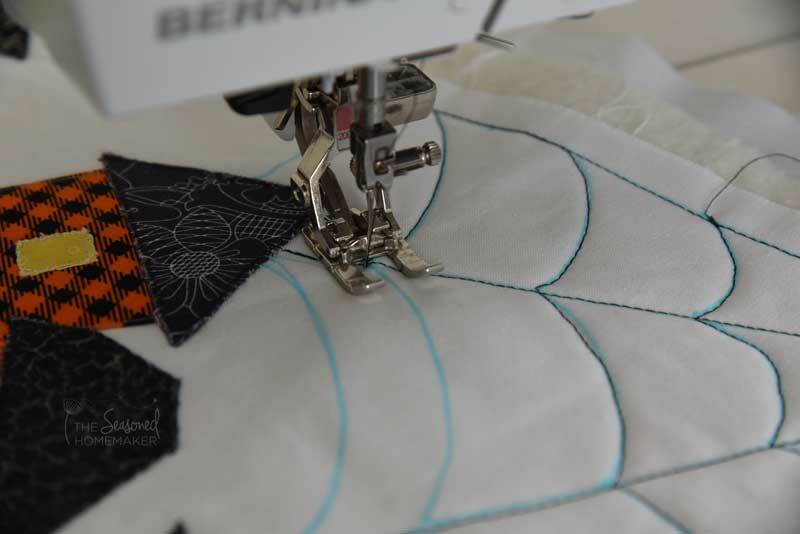 Step 5 – Stitch down the appliqués. 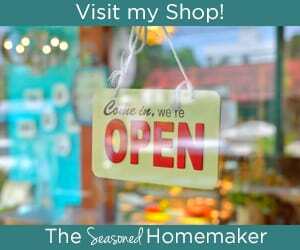 This is where you can get really creative! I’ve seen people use decorative stitches for their houses and roofs. I used a small zigzag to secure mine. Step 6 – Cut out the center medallion. 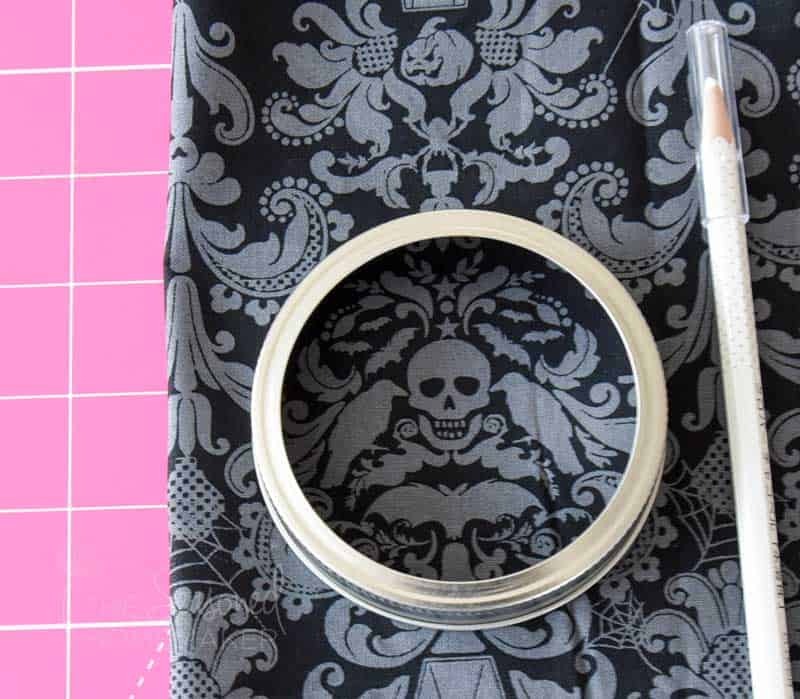 I used the lid of a wide-mouth mason jar for my template and it was the perfect size. I traced around the ring and then added 1/4″ for a seam allowance. This also allowed me to center my design for fussy cutting. 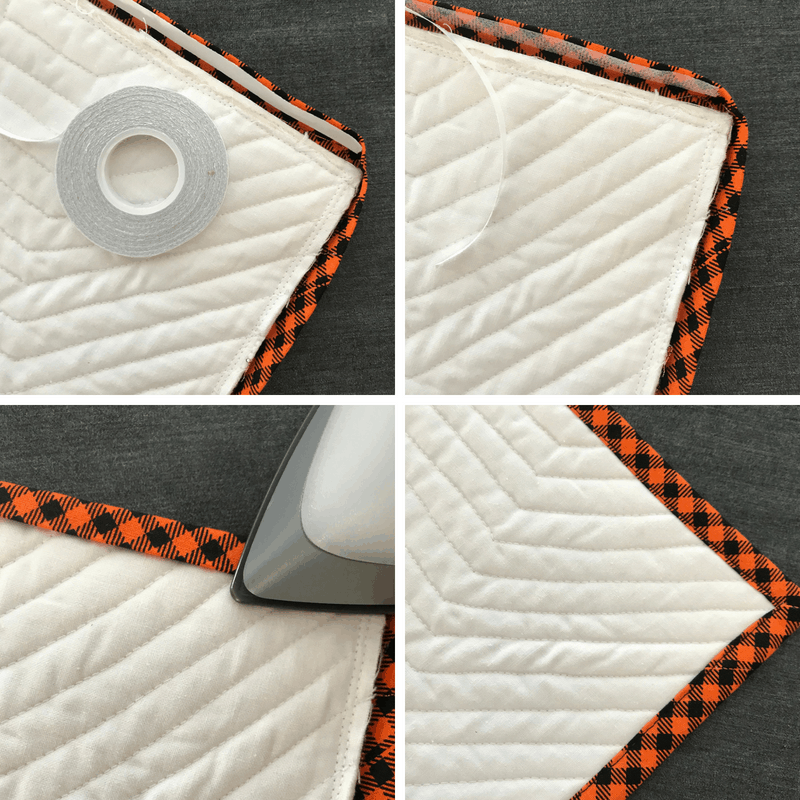 Step 7 – Make a quilt sandwich and start quilting. I used a fusible batting which I highly recommend for this type of project. I had a lot of fun doing the quilting. The spider web is in one corner and the rest of the quilt follows the roof lines. I let the shapes dictate my quilting and basically echoed these lines. Be sure to use a dual feed or a walking foot to prevent any shifting. 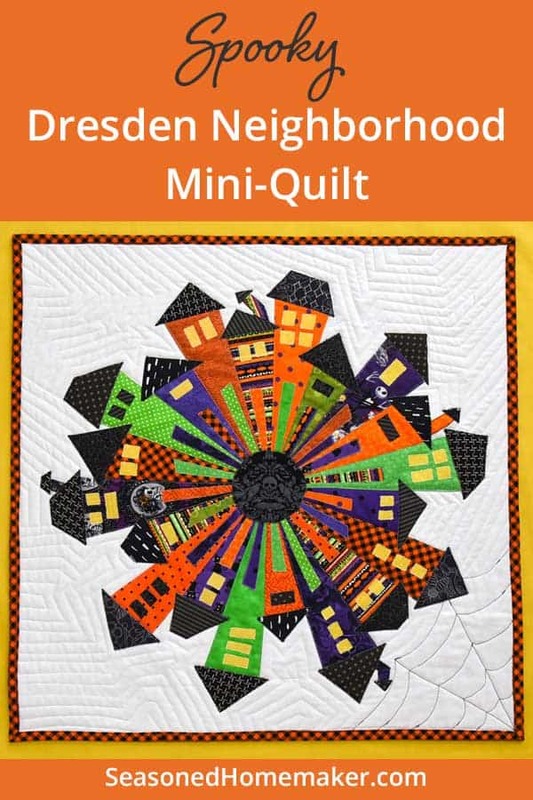 I’ve also seen several people do spiral quilting. I almost went in this direction, but I really wanted a spider web. Step 8 – Trim and bind the quilt. There is a little trick I recommend for binding. 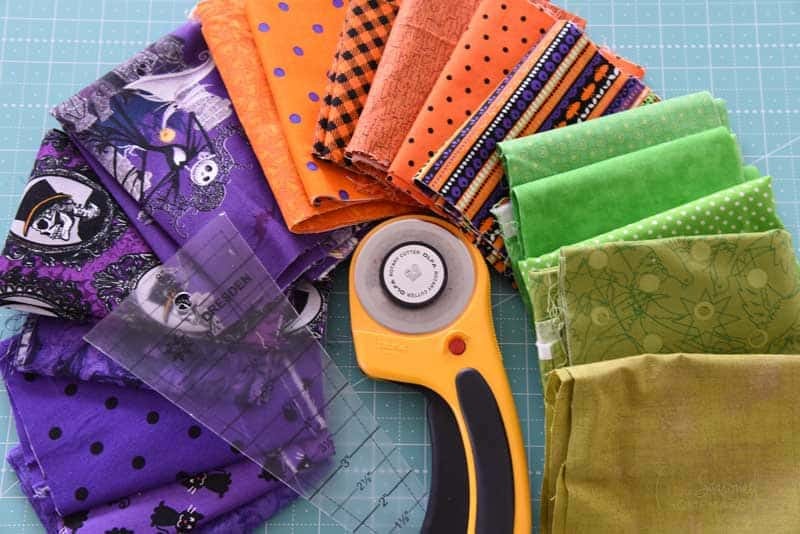 Use Wonder Tape as a way to keep the binding from shifting while sewing. This product holds the binding secure while you sew and it washes out. You can also get a better picture of my quilting, here. That’s all there is to it. I can’t wait to hang this up for Halloween every year! And, I can’t wait to see what your designs. 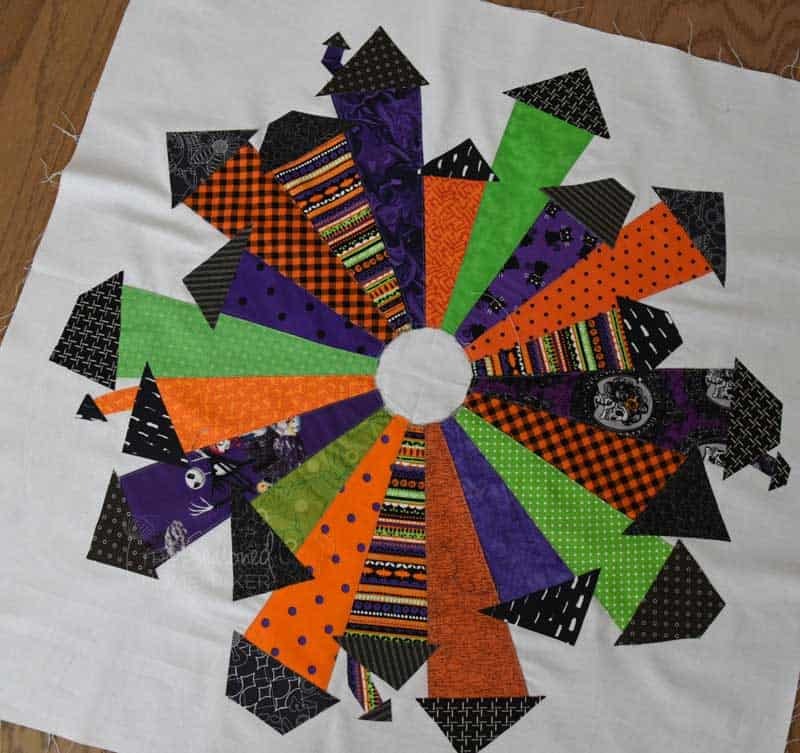 Here’s another Halloween Quilt Idea – the Spooky Spider Mini-Quilt! 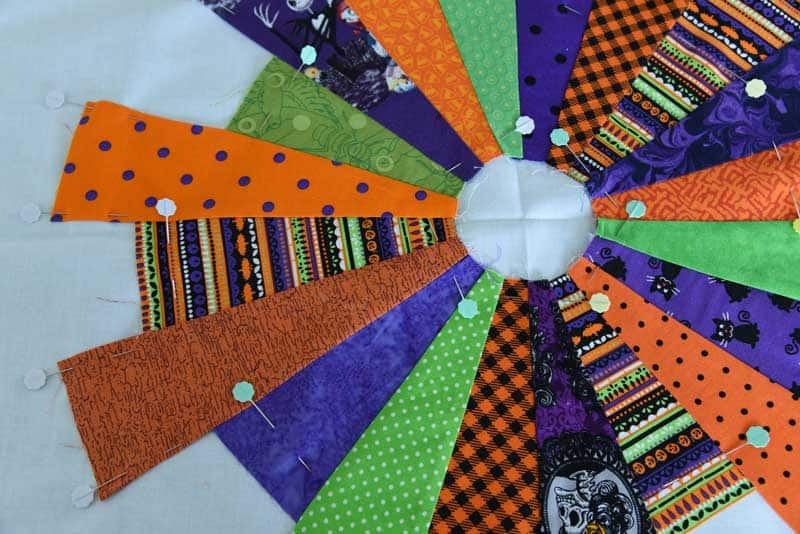 Be sure to check out all of the other great projects in the Halloween Sewing and Craft Party. Love it. It’s colorful and looks easy to make. How absolutely wonderful…Just looking at it makes me Smile! Oh my gosh, this is soooo good! What a fun little table topper. Thank you for the tutorial!! I can’t wait too make this!! I love your version! thanks so much for sharing the link to my pattern 🙂 I really appreciate that! Thanks again! Looks fabulous! The link to the free pattern doesn ‘t work. Would someone be able to share the pattern? Much appreciated as it’s for a fund raiser. Thanks. I took a class on this and the women teaching know nothing about the pattern. They sold the wrong Dresden ruler and said we could stick the blades without seaming. It is a mess. Thank you so much for this instruction. It has saved my fabric from the garbage. This is so cute! I have added it to my list to make this month. Thank you for the easy directions.